Not just the slowest, but the Empire probably couldn't do anything with it on Hoth in the snow. 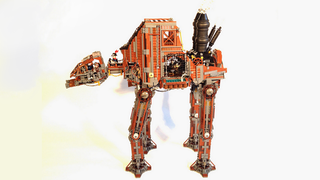 Markus1984 built this alternate, steamy LEGO version of the AT-AT walker for a building competition and while it might be slow, those gatling guns in front look really badass. Here are some close-ups. Check out the builder's gallery for more.